On this date in 1941, Harry Gleeson hanged for murder in Ireland — wrongly, the government admitted in 2015. Gleeson was the nephew and farmhand of a man called John Caesar, whose County Tipperary property abutted a cottage inhabited by a local prostitute called Moll McCarthy. On November 21, 1940, Gleeson found Moll McCarthy dead on a farm field. Her face had been destroyed by a gunshot; her murder orphaned seven children, many of them the illegitimate progeny of local married men. Nine days later, Irish police arrested a surprised Gleeson for the murder. He hotly denied their theory that he had availed himself of the victim’s services, and then slain her to prevent his uncle finding out about it. As a criminal case, it involved that brew of tunnel vision preoccupation with the wrong guy and outright cheating to nail him that frequently characterizes errant convictions. But there may have been a political undercurrent besides. MacBride himself might have pulled some punches from the defense bar in view of the possibility — as charged by Kieran Fagan in The Framing of Harry Gleeson — that McCarthy was actually murdered for informing on IRA men. 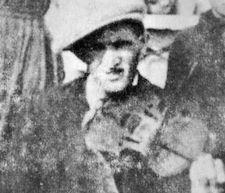 * MacBride’s father John “Foxy Jack” MacBride hanged in 1916 for his role in the Easter Rising.